@dot_Sp0T? Question: Cuban Missile War situation sounds grim so far, correct? @FutureHistorian are you talking about the thing that happened in the 60s? An alternate Cuban Missile Crisis that escalates into World War III. Another name is the Cuban Missile War, but at the time, it was World War III. I finished the draft for the Cuban Missile War's introduction. Writing idea; a man jumps in his car, tells it to just drive until he tells it to stop, and then dies. @AndyD273 Oh god. That car would get so very bored. 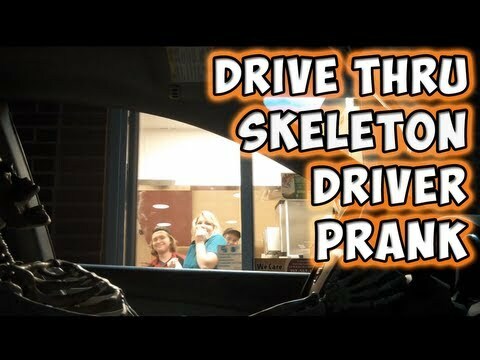 @JoeBloggs Assuming the man had enough money in his bank to pay for fuel, I wonder how long it would take before someone realized that it wasn't just the old "fake skeleton driving a car" prank. 1. 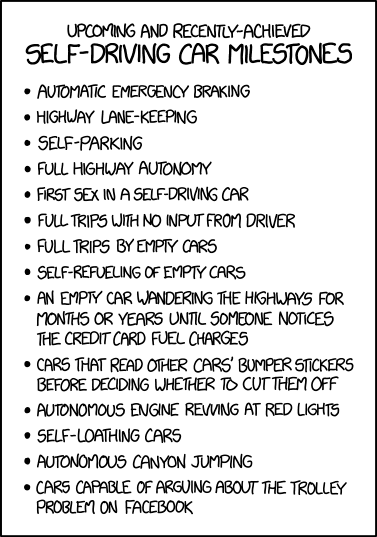 Invent fully autonomous self driving car. 2. Invent fully autonomous robotic fuel stations. 3. Lure victim into car. 5. Why am I doing this again?? @AndyD273 We have a lot of questions for 4 and if those are not enough you can ask a specific one on the Main Site. It shouldn't take long to get a handful of gruesome answers. About 5: for... the story? @Secespitus Just thinking that steps 1-3 are kinda unnecessary. About 5, I would have also accepted "for... Profit?" Can you imagine the episode of Criminal Minds??!? @JoeBloggs The thing is: if they catch the car, what will they do to it? It's a car, not a human and as far as I know we currently don't have laws about punishing cars. Send it to car prison? Switch it to old tyres? Don't wash it for a year? @sphennings You are being too lawyer-ly about that question. @kingledion I can't make sense of the bit about restaurants and smokestacks. So I'm going off the part I can understand. If the question was something like "People in my fantasy world live inside the trunks of trees. What fire resistant trees would they build their kitchens in?" I wouldn't have any complaints. Regarding the Michigan question it's asking about an alternate history, which exactly the sort of question worldbuilding is designed to answer. While it is asking about the effect of an event (or lack thereof) on society. It's is specific enough to not be too broad. @kingledion That's how I'd go about answering it, but the question could also be answered by suggesting some other industry that would fill the void left by the automotive industry. @Secespitus I imagine it would end with a high speed chase and the car driving over a cliff rather than doing time. @JoeBloggs "You'll never catch me alive!... Intact!... Complete...? Ermmm..."
@Secespitus Self censoring can be entertaining. A: Why might wizards be unable to wear armour? Obviously, it's because a wizard's staff is too long. The armour won't fit. Go forth and self moderate. Gentlemen? Hearts of Iron IV: Cold War mod playthrough has resulted in a conventional World War III over Korea, and NATO got steamrolled......badly. Well, the status quo in Europe from a borders perspective remains, but NATO as a military and political alliance is crippled to a degree that I never expected as I began to steamroll Europe. In fact, much of their military is destroyed, and West Germany is practically defenceless for all intents and purposes. Q: Is there hard data on users' reopen voting patterns? Unless you count America and the British forces in Britain itself, the French armies that were fortunate enough to survive the Soviet March (get it? ), Spain, Portugal and Italy (Turkey has yet to join and will probably not be willing to due to the defeat of NATO by the Soviets during WWIII). @MonicaCellio @MichaelKjorling I added some data on other sites. Request that you delete all those comments, while you are at it, I'd like to encourage more discussion. @kingledion Hey there! Let me know if you make any progress on the interferometer question; I'm also interested in it.